ARCHIVES: COMFORT FOODS 2017 | COFFEEBREAKWITHFRIENDS! ON THOSE COLD WINTER DAYS! 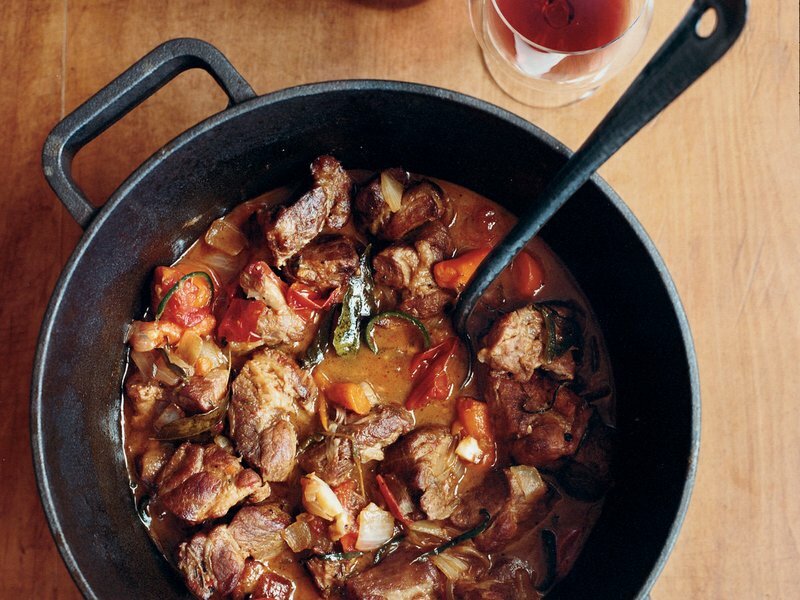 When Ethan Stowell was growing up, his father was the family cook; beef stew was one of his specialties. Unlike his dad, who favored rump roast, Stowell uses short ribs, a marbled cut that turns fabulously succulent and tender when slow-simmered. In a very large enameled cast-iron casserole, heat the vegetable oil until shimmering. Season the pork with salt and black pepper and add half of it to the casserole. Cook over moderate heat, turning, until browned all over, about 10 minutes. Using a slotted spoon, transfer the pork to a plate. Brown the remaining pork. Return all of the pork to the casserole along with any accumulated juices. Stir in the onions, garlic, carrots, chiles, bay leaves, cloves, lime juice and chicken stock. Season with salt and pepper and bring to a boil. Add the tomatoes, nestling them into the liquid. Cover and cook over low heat until the pork is very tender and the carrots are cooked through, about 3 hours. Discard the bay leaves and stir in the cilantro. Serve with rice and sliced jalapeños. The stew can be refrigerated for up to 3 days. Reheat before serving. Sprinkle roast on all sides with house seasoning. Using a skillet over high heat, sear roast until brown in oil. Place roast in a slow cooker, and layer onions, bay leaves, crushed bouillon cubes, garlic, and cream of mushroom soup. Add the Chardonnay and cover with enough water to cover all of the ingredients. Cook on the low setting for 8 hours. Mix the cinnamon, 4 teaspoons salt and 1/2 teaspoon pepper in a bowl; sprinkle all over the hens and inside the cavities. Place the hens on a rack set on a rimmed baking sheet and refrigerate, uncovered, at least 2 hours or overnight. Meanwhile, soak the grape leaves in water 1 hour. Bring the chicken broth and 2 cups water to a boil in a saucepan; add the rice blend and cook as the label directs. Drain and rinse under cold water. Preheat the oven to 400 degrees F. Melt 4 tablespoons butter in a large skillet over medium-high heat. Add the shallot, garlic, ginger and cumin and cook, stirring, until soft, about 3 minutes. Remove from the heat; add the cooked rice, pomegranate seeds, and chopped parsley and cilantro; toss to coat. Season with salt and pepper. Add the egg yolks and stir to combine. Make the glaze: Bring the orange juice and pomegranate molasses to a boil in a small skillet over medium heat. Cook until reduced by half, about 5 minutes. Remove from the heat and swirl in the remaining 2 tablespoons butter. Meanwhile, drain the grape leaves and pat dry. Use some of the leaves to line a 9-inch pie dish. Fill with the reserved rice mixture and drizzle with 2 tablespoons water. Cover with the remaining grape leaves, shiny side up, then cover with foil. (If you aren’t using grape leaves, spoon the rice into a pie dish, sprinkle with water and cover with foil.) After the hens have roasted about 20 minutes, transfer the rice to the oven and cook until heated through, about 45 minutes. Transfer the hens to a platter and add some parsley and cilantro sprigs and pomegranate seeds. 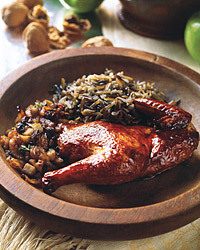 Peel the grape leaves off the top of the rice and serve alongside the hens. Remove 4 strips orange zest with a vegetable peeler. Squeeze the orange and strain the juice. Melt the butter with the sugar, orange zest and vanilla bean in a large skillet over medium heat. Cook, stirring, until the sugar caramelizes, about 5 minutes. Remove from the heat and stir in the liqueur, orange juice and a pinch of salt. Return the skillet to medium heat, add the bananas, cut-side down, and cook until glazed and golden, 1 to 2 minutes. Remove from the heat and divide among bowls. Add the rum to the pan and return to medium heat. Warm for a few seconds without stirring, then carefully tilt the pan so the rum ignites (if using an electric stove, hold a lit match near the sauce to ignite it). Spoon the flaming sauce over the bananas. Garnish with whipped cream and the glazed orange zest. walnuts, cinnamon, and butter. Spread the mixture over the bottom of the pan. the hens with some of the glaze and then cook for 10 minutes. Remove the roasting pan from the oven. Stir the fruit-and-nut mixture and turn the hens over. 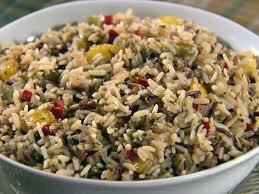 Earthy wild rice or bulgar pilaf will balance the sweet fruit dressing here. 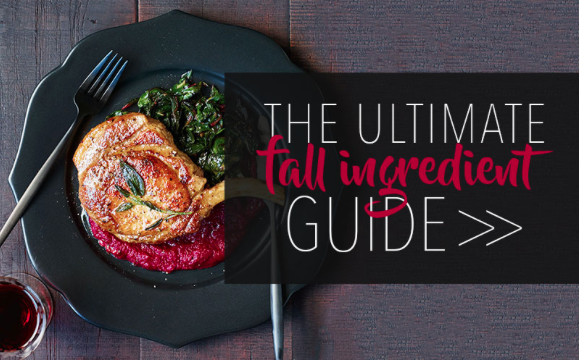 few distinctly autumnal ingredients: sage, apple and hard cider. 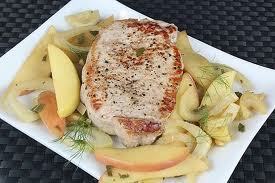 Season the pork chops with salt and pepper. In a very large skillet, heat the olive oil until almost smoking. Cook the pork chops over high heat, turning once, until browned around the edges and just cooked through, about 3 minutes total. Transfer the pork chops to a plate and keep warm. In the same skillet, melt the butter. Add the leek and cook over moderate heat until tender, about 3 minutes. Add the fennel and apple and cook, stirring occasionally, until softened, about 4 minutes. Add the sage and cook until fragrant, about 30 seconds. Season with salt and pepper, transfer to a platter and keep warm. it requires boiling in a larger quantity of water. Preheat the oven to 325 F. Lightly coat a baking sheet with cooking spray. Spread the almonds on the baking sheet and bake, stirring occasionally, until golden and fragrant, about 10 minutes. Transfer immediately to a plate to cool. In a medium saucepan, bring 3 cups of water to a boil. Add the rice. Reduce heat and cover. Keep adding water as necessary to prevent the rice from drying out. Simmer until the rice is tender, about 45 to 60 minutes. Pour through a fine-meshed strainer to drain. Return the rice to the saucepan and stir in the dried cranberries. Cover and set aside. In a small bowl, whisk together the oil, vinegar and sugar. In a large bowl, combine the rice and diced apples. Add the oil mixture and toss to coat evenly. Serve warm or cold on individual plates. Top with toasted almonds. In a large saucepan, bring 6 cups of the broth and 6 cups of water to a boil; add wild rice and return to a boil. Reduce heat and simmer uncovered, stirring occasionally, until rice is tender but firm, about 35-40 minutes. In another saucepan, saute the onions in the butter until tender, about 10-12 minutes. Add APPLES and saute until soft. Add the spices and stir until aromatic, then add the remaining broth and 3 cups of water, the cranberries, raisins, and orange zest. Season with salt and pepper, bring to a boil, then add the white rice and reduce heat to low, cover, and cook until rice is tender, about 20 minutes. Remove the bay leaves from the white rice and discard. Mix together both rices and stir in the pine nuts; adjust seasonings if necessary. Preheat the oven to 400°. 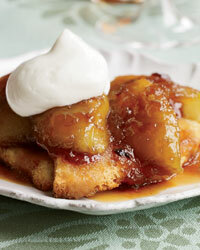 In a 7- or 8-inch ovenproof nonstick skillet, arrange the apples snugly, cored side up. Add the maple syrup, honey and 2 tablespoons of the butter and bring to a boil over high heat. Reduce the heat to low, cover and cook, gently shaking the pan occasionally, until the apples are tender, 5 minutes. Uncover and cook over high heat, shaking the pan a few times, until the liquid is evaporated and the apples are caramelized 7 minutes. Arrange the bread slices in a square on a work surface. Trim the corners of the slices to form around the size of the skillet. Spread the bread with the remaining 1 tablespoon of butter and sprinkle with the sugar. Arrange the bread over the apples, sugared side up. Bake for 20 minutes, until the bread is toasted. Invert the charlotte onto a plate. 3. In a heatproof bowl, melt the apricot preserves in a microwave oven for 30 seconds. Spread the preserves over the apples. Cut into wedges and serve warm with a dollop of sour cream. In a large bowl, combine the spelt flour with the yeast, water, honey, 1 tablespoon of the olive oil and 3/4 teaspoon of kosher salt and stir until a dough forms. Turn the dough out onto a lightly floured surface and knead just until smooth, no more than 1 minute. Oil the bowl and return the dough to it. Let the dough rise, covered, in a warm, draft-free place until doubled in bulk, about 1 hour. Line a baking sheet with parchment paper. Punch down the dough, then transfer it to the baking sheet and press it into a 12-by-8-inch oval. Brush with 1 teaspoon of the olive oil. Press small indentations all over the dough and sprinkle with the rosemary and sea salt. Let the dough stand uncovered for 45 minutes, until slightly risen. Preheat the oven to 375°. Bake the focaccia for about 30 minutes, until lightly browned all over. Meanwhile, in a bowl, toss the kale with the lemon juice, crushed red pepper and 1 teaspoon of oil. Squeeze the kale gently to soften it, then let it stand for 20 minutes. In a large nonstick skillet, heat the remaining 1 teaspoon of oil. Add the squash, season with kosher salt and cook over moderately high heat until golden, 2 minutes. Turn the squash, add the garlic and cook over moderately low heat until the squash is tender, 5 minutes. Top the focaccia with the kale and squash and bake for 1 minute longer, to heat the vegetables. Scatter the pecorino on top, cut into wedges and serve. Spelt is a type of wheat with a nutty, sweet flavor. Look for spelt flour in health-food stores. One Serving 380 cal, 57 gm carb, 11 gm fat, 2.5 gm sat fat, 11 gm protein, 10 gm fiber, 610 mg sodium. Heat the canola oil in a very large skillet until shimmering. Add the brussels sprouts and season with salt and pepper, then cook over high heat without stirring until they are browned, about 2 minutes. Add the unsalted butter and brown sugar and cook over moderately high heat, stirring occasionally, until the brown sugar is melted. Add the maple syrup and cook, stirring occasionally, until the brussels sprouts are just crisp-tender, about 7 minutes. Stir in the cider vinegar. Add the chestnuts and walnut oil and cook until hot. Using a slotted spoon, transfer the brussels sprouts and chestnuts to a bowl. Boil the cooking liquid over high heat until thickened slightly, about 2 minutes. Pour the sauce over the brussels sprouts and serve. In a large pot of boiling water, blanch the chard in batches until wilted, about 1 minute. Drain the chard, squeeze dry and chop it. Heat the oil in the pot. Add the leeks and a pinch of salt. Cover and cook over moderately low heat, stirring, until tender, 7 minutes. Uncover, add the garlic and cook, stirring, until fragrant, 2 minutes. Add the chard, season with salt and remove from the heat. Preheat the oven to 425°. Butter a 10-by-15-inch baking dish. In a large saucepan, melt the butter. Stir in the flour over moderate heat to form a paste. Gradually whisk in one-third of the milk and cook, whisking, until the mixture starts to thicken. Repeat two more times with the remaining milk. Bring the sauce to a boil, whisking constantly. Reduce the heat to low and cook, whisking often, until thickened and no floury taste remains, 15 minutes. Whisk in the cheeses and the nutmeg; season with salt and pepper. Mix the sauce into the leeks and chard. Season with salt and pepper. Transfer the mixture to the prepared baking dish. Bake in the upper third of the oven for about 25 minutes, until bubbling and golden brown on top. Let rest for at least 10 minutes before serving. Preheat the oven to 400°. Roast the poblanos directly over a gas flame or under the broiler, turning, until they are charred all over. Transfer the chiles to a bowl, cover tightly with plastic wrap and let them cool. Peel, stem and seed the chiles, then cut them into thin strips. Brush the butternut squash with 6 tablespoons of the olive oil and spread it on 2 large rimmed baking sheets. Sprinkle with 1 teaspoon of the thyme and season with salt and pepper. Roast for about 25 minutes, until the squash is tender, shifting the pans from top to bottom and front to back halfway through baking. Increase the oven temperature to 425°. Meanwhile, in a large, deep skillet, heat the remaining 3 tablespoons of olive oil. Add the sliced onion, garlic, oregano and the remaining 1/2 teaspoon of thyme and cook over moderate heat, stirring occasionally, until the onion is softened and fragrant, about 8 minutes. Add the poblano strips and cook until they are very tender, about 5 minutes. Add the heavy cream and simmer until thickened, about 5 minutes. Remove from the heat. Stir in the crème fraîche and season the poblano mixture with salt and pepper. Spoon half of the poblano mixture into a large baking dish and top with half of the butternut squash and half of the Monterey Jack and farmer cheeses. Repeat with the remaining poblano mixture, butternut squash and both cheeses. Bake in the center of the oven for about 30 minutes, until the gratin is golden and bubbling. Let the gratin rest for 10 minutes. Garnish with the pumpkin seeds and serve. Farmer cheese is a form of cottage cheese that has had the liquid pressed out of it. It’s slightly tangy with a dry texture that makes it great for crumbling. Look for it at specialty-food stores or at cheese shops. Preheat the oven to 350°. Brush the squash with oil and season with salt and pepper; arrange on a baking sheet cut side down and roast for about 20 minutes, until lightly browned. Flip the wedges and roast for 20 minutes, until just tender. In a saucepan, melt the butter with the sugar, maple syrup and thyme. Cook over moderately low heat until the sugar has dissolved, about 3 minutes. Turn the squash skin side down and brush all over with the maple glaze. Roast for 10 minutes longer, until the squash is lightly browned and glazed. In a saucepan, whisk the cream with the maple syrup. Add the garlic and thyme and simmer over moderately high heat until reduced to 1/3 cup. Discard the garlic and thyme and keep warm. In a medium saucepan, melt 2 tablespoons of the butter. Add the minced shallot and cook over moderate heat until softened, about 3 minutes. Add the bay leaf, thyme and water and bring to a boil. Season with salt and pepper, then add the quinoa. Cover and cook over moderately low heat until the quinoa is tender and the water has been absorbed, about 15 minutes. In a large skillet, melt the remaining 1 tablespoon of butter in the oil. Add the sliced shallots and cook over moderately high heat, stirring, until lightly browned. Add the oyster and shiitake mushrooms and cook until browned on the bottom, 3 minutes. Continue cooking, stirring occasionally, until the mushrooms are browned and tender, 6 minutes more. Stir in the quinoa and parsley and season with salt and pepper. Arrange the roasted squash on plates. Fill each wedge with the quinoa stuffing, drizzle the sauce on top and serve right away. Preheat the oven to 375°. Spread the squash on a baking sheet and toss with 2 tablespoons of the oil. Season with salt and pepper. Bake for 25 minutes, until just tender. Transfer to a bowl. Increase the temperature to 400°. Meanwhile, in a skillet, melt the butter in the remaining 2 tablespoons of oil. Add the shallot and cook over moderate heat, stirring, until softened. Add the mushrooms, cover and cook, stirring, until tender, about 7 minutes. Season with salt and pepper and remove from the heat. Toss with the vinegar and nutmeg and add to the squash. Line a baking sheet with parchment. On a floured work surface, roll the puff pastry out to 12 1/2 by 14 1/2 inches. Using a knife, trim the pastry to 12 by 14 inches. Transfer to the baking sheet and prick the pastry with a fork all over except for a 1/2-inch border. Bake the pastry for 20 minutes, until golden; pierce with a fork if it puffs during baking. Let cool. Stir the egg yolks, crème fraîche, Gruyère, thyme, 1/2 teaspoon of salt and 1/4 teaspoon of pepper into the mushrooms and squash. Spread the mixture on the pastry inside the border. Bake for 15 minutes, until the cheese is melted. Cut into squares and serve. Preheat the oven to 350°. In a large, deep skillet, melt the butter in the olive oil. When the foam subsides, add the onion, carrots, radishes, turnips, cabbage, apple and garlic. Season with salt and black pepper and cook over high heat, stirring, until the vegetables are lightly browned in spots, about 6 minutes. Add the chicken broth and bring to a boil. Cover and braise in the oven for 25 to 30 minutes, until tender. Remove from the oven, stir in the pear pieces and cook over high heat until the liquid is evaporated and the pear is tender, about 5 minutes. 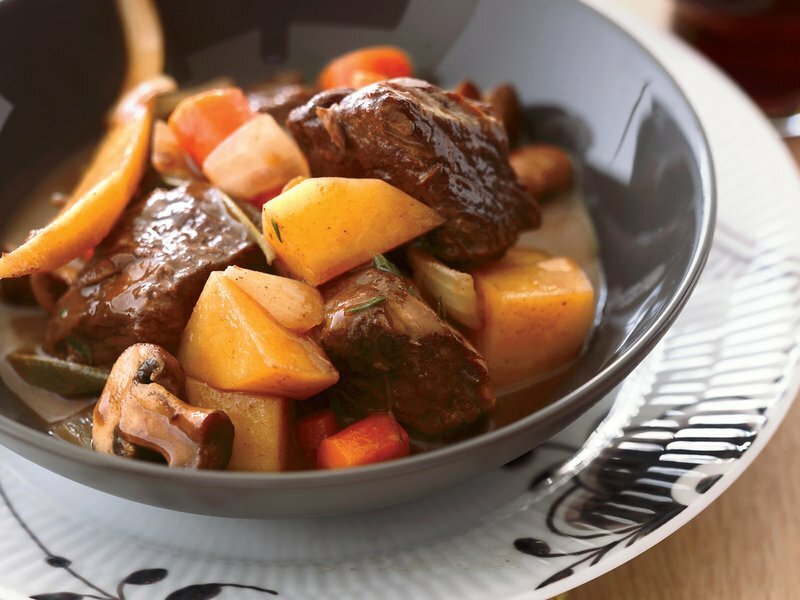 Transfer the braised fruits and vegetables to a bowl and serve.